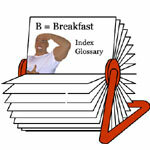 Mr Breakfast will occasionally write a column based on a question recieved from a site user. The collected Ask Mr Breakfast columns can be found in The Breakfast Times - the section of the website dedicated to breakfast information and news. For the fastest response from Mr Breakfast, it's recommended that site users post a message on the Mr Breakfast Facebook Page which is checked daily. "Great Breakfasts" Start With The Letter "A"